It’s Sunday night, and your alarm is ringing. Every weekend, the beeping sound rips through your thoughts and reminds you to log into your Amazon seller account. A while back, you found out that your Sponsored Product Ads mainly lead to sales during office hours — in a different time zone! You stayed up late to test your dayparting theory. You paused campaigns at night and restarted them in the morning when your marketplace opened for business. It worked! You saved your company a ton of money and made your boss a happy person. Since then, your alarm rings twice a day. You wish you could automate this process — some option for Amazon ad scheduling that you just set up once and watch the cash roll in. Our new dayparting feature is now available in the Sellics PPC Manager (Seller Edition) and the Sellics AMS Manager (Vendor Edition). Our customers requested this feature, so we made it. Competition for Sponsored Product Ads (SPAs) has become incredibly intense. We understand this — here at Sellics, we are dedicated to helping you maximize the efficiency of your ad spend. 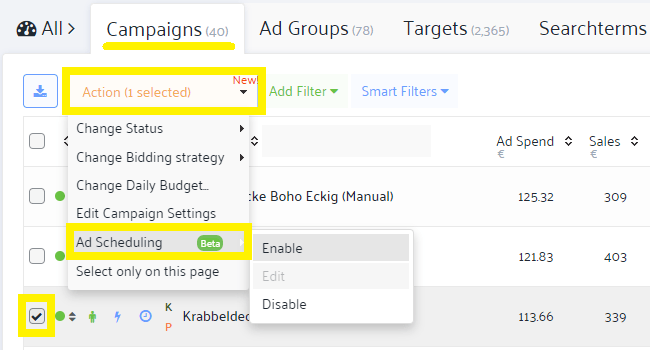 In the Sellics PPC/AMS manager, select the campaign(s) you wish to schedule to run (or suspend) at specific times. Decide how you want to split up the day. You can leave the default setting to “Full Day” or choose up to four time segments within 24 hours. Next, define the time you want each segment to begin and end. A segment can be as long or short as you want. You can also repeat a pattern for the entire week. If you want your SPAs to suspend during the night, for example, define a time segment and click on “All Days” to pause this segment every day of the week. The same bulk process turns full days off or on. Every business is different — You will need to experiment a little to figure out the setting that benefits you the most. Here are some ideas to get you started. Amazon provides you with analytical data about your SPAs on a daily basis — not hourly. This limitation means you can’t see instant results for your dayparting — even with Sellics. Fortunately, we’ve made it easy for you to compare the performance of your campaigns before and after you introduce ad scheduling. This is how: First, use dayparting to pause your campaign at times you assume to be unprofitable. 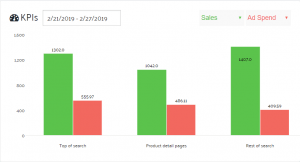 After a week or so, use the Sellics KPI overview and trend graphs to compare how your performance developed in this time frame: Has your ROI changed? Check for a higher conversion rate or lower ACoS%, for example. Again, this depends on your product category. If you sell B2B products, for example, your SPAs will probably have the most impact during office hours. In this case, try pausing campaigns at the weekend and outside of office hours — or vice versa, if you’re targeting private consumers. At any rate, most people sleep at night — try pausing your SPAs until the morning. Bonus: Worried about competitors from a different time zone clicking on your ads? Now you can sleep easy! Sellics turns your ads off for you. Can I Use Sales Data to Figure out the Best Times for Ad Scheduling? In contrast to your advertising performance, Amazon does provide sales data on an hourly basis. You might be inclined to define your ad schedule by the times and days when customers placed the most orders. Tip: For data on more than one day, go to Seller Central and download a transaction report. Try it out — but tread carefully. Some shoppers browse through Amazon over several days, filling up their cart to reach free shipping or adding and replacing items until they reach a decision. The day they click on “Buy Now” might not be the day they see your ad. Our recommendation: Use this strategy to find out if your audience consists of impulse buyers or shopping cart hoarders. You’ve optimized your listing, your keywords, and your advertising campaigns — now step up your game and get the timing right. No more ads in slow periods. Stop wasting money on a few expensive clicks that don’t lead to sales. Sleep easy: No more alarms to remind you to start and stop campaigns in Seller Central. Sellics does everything for you. Reclaim your time for family and business — Save money with just a few clicks. Sellics is the leading all-in-one solution for your Amazon business. Ad scheduling with Sellics is completely automatic. Do you have any questions or feedback? Let us know in the comments — We look forward to hearing from you!